One of the best parts of playing football is the fact that you hardly need any equipment to get a game started. At its most basic, all you need is the ball and a decently large place to play; everything after that just serves to add consistency and simplicity to the game. If you're not just playing pick-up games in the park on the weekends, though, you'll need to pick up a few more pieces of gear to ensure you can compete on the same level as your peers. The boots you wear are an essential component to competition, affording you the ability to grip the turf better, enabling quick plays and improved agility. At first, you might think that choosing boots for your football games is as simple as buying regular trainers or shoes you might wear during an average day. In reality, though, there are a lot of factors at play when you want to secure boots that will help improve your performance. From matching them to your playing surface to choosing a design that enables you to play comfortably, you'll want to develop a good sense of what to expect before you go shopping. Here's what you'll need to know to make that task more straightforward. Football games take place on a wide variety of surfaces, and it's essential to choose boots that align with the surface type you will encounter most often. Sometimes, it is even a good idea to pick up multiple pairs for different surfaces. You cannot use some types on particular surfaces due to the risk of damage or even injury to yourself. So what type of ground do you encounter most often? A "firm" surface is a typical natural pitch with normal soil; it's neither very hard nor very soft. The studs on these boots are often made of plastic, which will provide adequate grip on grass and non-muddy fields. Don't take these indoors, as the studs can damage artificial turf. Likewise, you don't want to wear soft surface boots indoors either. These boots are perfect for ground that's frequently muddy or waterlogged. Their metal studs pierce the ground and give you the grip necessary for quick turns and agile maneuvers. Artificial turf boots use short studs to reduce the strain of this playing surface on your feet while avoiding damage to the surface. Only use these if you exclusively play on artificial surfaces, as they won't give you the right level of grip in other contexts. Likewise, if you play indoors, you'll want boots that don't use studs at all but instead provide slip protection with rubber soles. If you never play a fixed position, opt for boots that offer good all-around versatility and comfort. If you choose to specialise for a position, though, you'll want to look for ways to give yourself an advantage through footwear. Midfield players, for example, need to prioritise comfort above almost everything else because you will continuously be on the move throughout the 90 minutes. On the other hand, goalkeepers should opt for boots that put grip first, to allow you to quickly pivot and move with sure feet to stop incoming strikes. Forwards, on the other hand, should stick to lightweight shoes that offer the best agility. Defenders want something similar, but with more protection for the foot to allow for more solid passing and tackling. Manufacturers often market particular boot models towards the players best suited for them, so it should be straightforward to locate pairs that align generally with your play style. However, take the time to try them on and even move around in them to create a sense of how they will allow you to play on the pitch. Leather is far and away one of the most popular materials, whether it is calf leather or the rarer kangaroo leather; both allow you to make good, firm contact on the ball while also offering superior comfort. Leather tends to shape to your foot, providing a boot that stays resilient no matter how many times you wear the pair. Synthetic leathers continue to gain in popularity as a more humane alternative to traditional leathers; these synthetic fibres often offer better breathability and waterproofing than their counterparts. Mesh boots can be a good option for midfielders and players in the wings as they offer exceptionally lightweight performance, but their thin material means you can be left with soggy feet at the end of a game. Other, newer fabric types are also in the process of rolling out, and shoemakers look to innovate every year. Overall, the material you choose is not tooimportant, but it will influence the way you feel the impact of the ball. How tightly should your boots fit? The fit depends in large part on the type of material you choose. Are you opting for leather or even synthetic leather boots? Consider buying boots that are about half a size smaller than you would normally wear. While it will feel tight the first few times you wear them, a couple of play sessions will allow the leather to stretch out into the shape of your foot. From that point on, the leather will conform relatively closely to your foot, providing a better grip. If you're opting for any other material, such as a standard synthetic fibre or a mesh design, stick to your regular shoe size. These materials were not designed to incorporate any stretch into them, so you can expect them to fit more or less from the first time you wear them. However, also be mindful of the fact that you will wear socks beneath the boots; therefore, you may need to move up one size instead. Try boots on in person to know for sure. How well you?ll be able to connect with and control the ball is arguably the most important aspect of the boots you choose, and it will have a significant influence on your play. Again, consider the position you play before you begin to make a choice in this category. 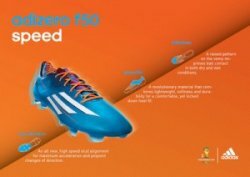 For forwards and strikers, choose a boot that uses technological features such as an improved strike zone on the side or front of the foot, which often consists of a special arrangement of the shoe's elements to impart more power from your foot as you kick. Control focuses on elements that are more to one side of the shoe or the other. By padding out these areas of the boots and shaping them appropriately, you will be able to pass with ease and stop passed balls immediately. When you need to execute some fast footwork to get around an incoming defender, these boots will yield exactly what you need. Examine them and their related marketing materials carefully to see which boots excel in which area. Keep your new boots in good shape to maximise their lifespan. After use, start by flipping your boots over and cleaning out the soles; remove all the dirt and grass possible to prevent unnecessary wear. Wipe off the exterior of the boot to ensure no other dirt remains. Then, consider crumpling up a piece of newspaper and tucking it inside your boots to soak up any residual moisture left inside. Now is also a good opportunity to use your favourite deodorising product. For leather shoes, consider a specialised leather care product to keep the material from developing unwanted cracking. With the right steps, you can protect your investment. At first, the sheer level of variety out there can feel intimidating, especially if you've never put that much thought into your football footwear before. However, once you understand the basics, finding shoes that provide you with the comfort and control you seek shouldn't be too difficult. Be sure to try on a wide variety of shoes, and don't be afraid to ask questions, either online or in the store. It's always helpful to rely on someone else's experience when you're still developing your own. Select boots with the material and construction that best align with your play style, and soon you'll see the difference the right equipment makes in football. This article was written for Sports Fitness, an online sporting goods store where you can order football boots, and other essential soccer gear.